NKBA San Joaquin Valley is the local chapter that brings together local San Joaquin Valley Kitchen & Bath distributors, retailers, remodelers, manufacturers, fabricators, installers, designers, and other professionals – and provides a resource for local consumers to research, educate and connect with San Joaquin Valley Kitchen and Bath professionals. 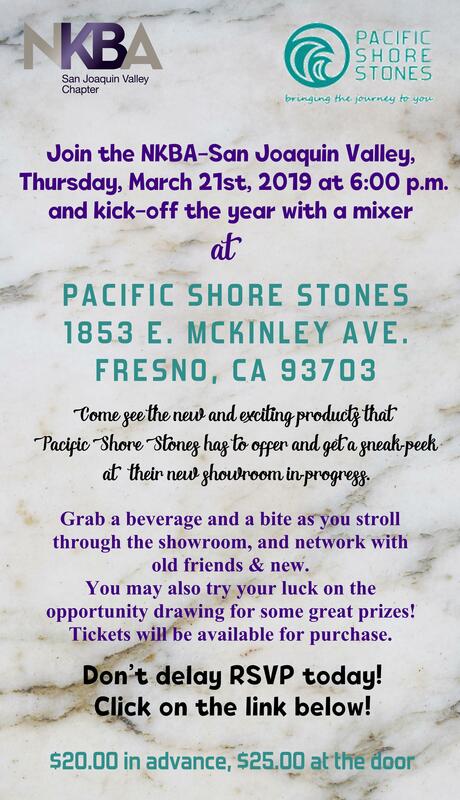 804 N Van Ness Ave.
We hope to see you at Pacific Shore Stones! Check out the attached flyer for all the info! 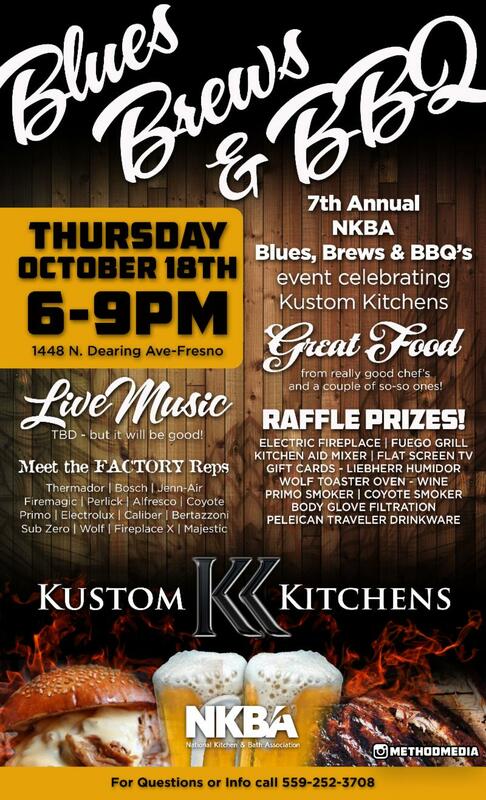 Plan on joining the NKBA-SJV at Kustom Kitchens for the annual BLUES, BREWS & BBQ event! Your tastebuds will be tantalized, your thirst will be quenched, you will enjoy live entertainment and above all, you will have the opportunity for great networking with others in our industry. If you can pry yourself away from the outdoor activities, take a wander inside and see their expansive showroom and all the new products they have to offer. Of course, there will be a fabulous raffle, be sure to take a look at some of fantastic prizes listed below! 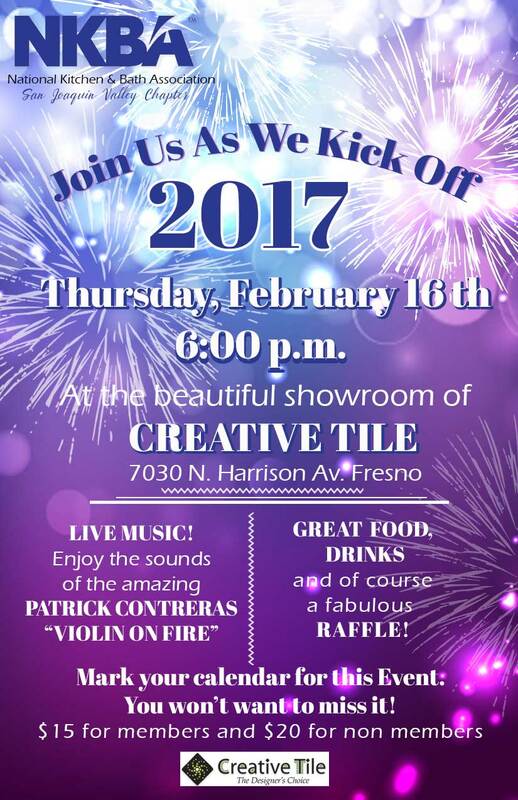 Join us for a fun-filled evening at Bedrosians Tile & Stone. 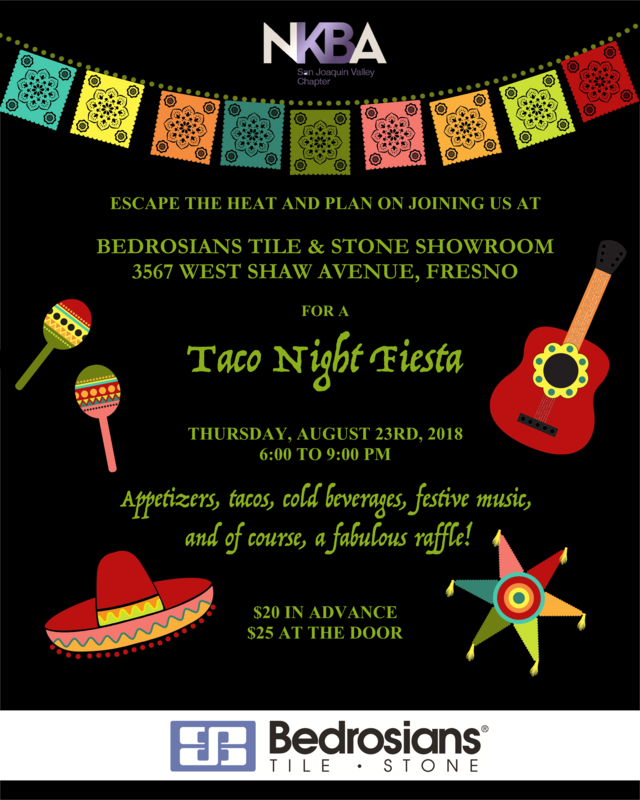 Cool off with a refreshing beverage, grab a taco (or two), and check out their expansive beautiful showroom along with the new products they are offering. Click the link below to register today! We hope to see you there! 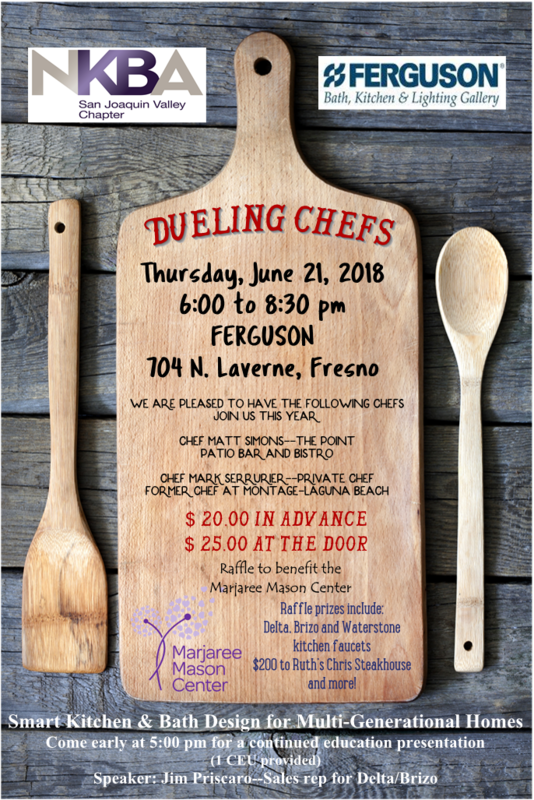 We invite you to join the NKBA-San Joaquin Valley Chapter at Ferguson Bath, Kitchen and Lighting Gallery as they present “Dueling Chefs”. At this event you will sample several courses from two local chefs who will entice you with their delicious fare! You will wander the expansive showroom at Ferguson with a cold beverage in hand, while networking with your peers. The evening will finish off with a fabulous raffle benefiting the Marjaree Mason Center. But first….before this ever-popular event, we have the pleasure of having Jim Piscaro, sales representative for Delta/Brizo. He will be giving a presentation on “Smart Kitchen and Bath Design for Multi-Generational Homes”. The purpose of this course is to dive deeper into the here-to-stay multi-generational household and what it means to building, remodeling and other trade professionals. (1 CEU) credit. This presentation will begin at 5:00 pm, so plan to come early and stay for Dueling Chefs! Click on the link below to register today!